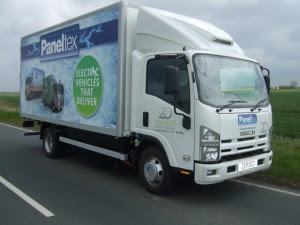 The Paneltex pure electric truck is based on the Isuzu Forward 7.5t chassis featuring a Paneltex ATP Class C type approved insulated body and electric refrigeration system. A combination of active and passive regenerative braking recovers the maximum possible braking energy, which, with the 100kWh battery, helps give this zero emissions urban delivery truck a long range. The 20kW on-board charger provides a full charge from flat in 5 hours, and in-built remote diagnostics and tracking provide live management information 24/7. Paneltex demonstrated its first Zeroed electric vehicle conversions based on the Isuzu Grafter truck chassis in 2008. Four years on, Paneltex continues to offer a range of vehicles from 5 to 11 tonnes GVW featuring 150kW peak power permanent magnet motors, and up to 100kWh of lithium iron phosphate battery capacity. Fully automatic, these vehicles offer brisk performance with ranges of up to 120 miles on a single charge in urban driving. The conventional chassis design allows bodywork of any design to be fitted.